Editor’s NOTE—Dr. Lobsang Sangay is the head of Tibetan government in exile, and the above article is originally published on the Wall Street Journal. The Tibetan leader used to write articles for the international journals, more often after being elected as head of the government. Sekyong Dr. Lobsang singye is the shine of the Tibet and represents the voice of Tibet.I am very much positive the time he become campaigned and the the leader of the country. I can hear those voices which i really don't like to hear, but as a democratic society one can criticize but with the judgement in justice and most appropriate solution for the matter will add for planes.So, If it makes sense, I am requesting Mr. Sekyong will discuss issue of China and American policy, review the policy of immigrant of the Chinese citizen to America. I am sometime confusing that America is supporting and protecting human rights in the world but with the china, USA have economical co-Human rights value added(VAT)and that policy and strategy is between the China and US. if US really wants China in Change for more openness and democratic society, US foreign policy must review Chinese citizen to migrant to US. Whose who migrant from mainland china to abroad in west are middle and rich families. so IS the US government really supporting and protecting human rights in the world? Stopping migrant mainland chines citizen to the west specially to America will immensely helping the voice of millions truth heart of Chinese people. if those professionals aren't their at strategy planning, its like missing a eye. so Chinese citizen needs them at the critical movement! But US too is capitalist! if US continues to immigrant Chinese citizen the editorship under the injustice won't be achieved justice. 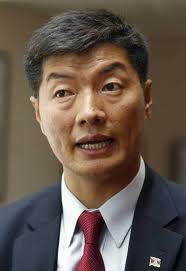 MY request to make for Mr. sekyong is change inside china, review the policy of US-Chinese migrants. it was an honor to have you as our prime minister and we always look up with respect whenever you appear before us. i feel as if there is still a hope, a hope not of getting back our nation, but a hope of awakening our youth from the modern drugs which seems to have made our youth a way too busy to even realize about our present stage. if we did work together as a team, then hoping and wishing for a freedom would not be an impossible task. so i like to suggest you to first wake up our youth in total with a thorough education at every Tibetan school on our nation's where about and its politic and then we can plan together on how we are going to tackle china instead to waiting for the America to do something for us. what you say? you can also throw my junk into the garbage if you did nt see any point in it. Firing journalist, n he himself is acting as journalist, huh!